No, no problem, it seems I've put it in the right folder after all. I was a little worried, because if you browse throught the different folders a bit, you find zillions different 'Maps'. As fascinating as our bodies are, they're also stupid. No problem, hope you enjoy it more than I did. I can't play it as I modified the core data files, and now they clash with the project's ones, causing the game to crash. Anyway, good luck. So, I can't play it. The game shuts down after the first phase. Then we get the usual pop-up, and I'm back on my desktop. I've found a spelling mistake, tough, at the intro during the loading screen. : '...to create and controle...'. Everybody seem to have problems with the Map I don't know why Do you have version 2.1? If not I don't have a faintest idea wat's causing this, Neckie told me it works fine on his PC and I can make it work flawless I can still play the HoF Campaigns too. About the spelling mistake I knew that, I didn't change it because I forgot to change the description of the Map the opening scene was a last minute add since the space to type the Map description is too short to post the prologue and the description, in the Beta it will have a new description. It worked all the way for me. Sorry Tenaka, can't help you as I have the very same problem, except mine doesn't work at all. I don't have 2.1, that's probably the root of it. It's funny how the CD turned out using my .dds converter. That's how I planned her. Also, is there a way to change the circle at the bottom? WOW! Awesome work Daystar! I left the mirror Textures untouched so he has some reflection wich looks really really awesome! 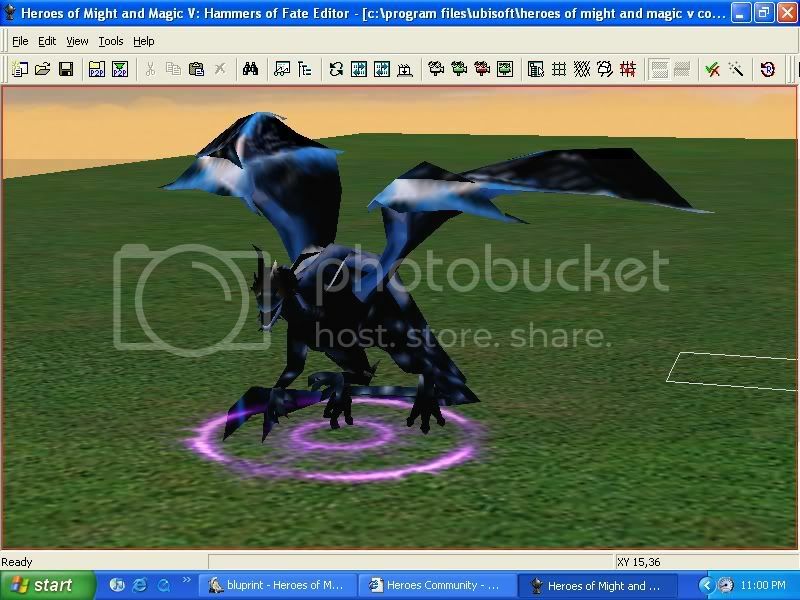 About changing the circle, unlike heroes, wich you can give any ring you want that�s just in the shared file, you need to change the Faction where the Creature is from, you can do that in the GameMechanics/Creature/Creatures/Dungeon/Black_Dragon.xdb you�ll see the line <CreatureTown>TOWN_DUNGEON</CreatureTown> if you want a star just change it to <CreatureTown>TOWN_ACADEMY</CreatureTown>, but I didn�t replace the Black Dragon so I have my own file for this mine is also TOWN_ACADEMY because a blue star fits the best imo. Edited by Daystar at 23:17, 22 Aug 2007. Agreed, esspecially with the new art. Is it okay as blue and not orange? Also, have you figured out transparency or bump textures yet? Personally I prefer the orange Dragon, as the blue one turned out badly on my machine... looked like it had lipstick or something. But then I used a different converter so it may have gone wrong somehow. In any case I would actually rather use the orange guy. 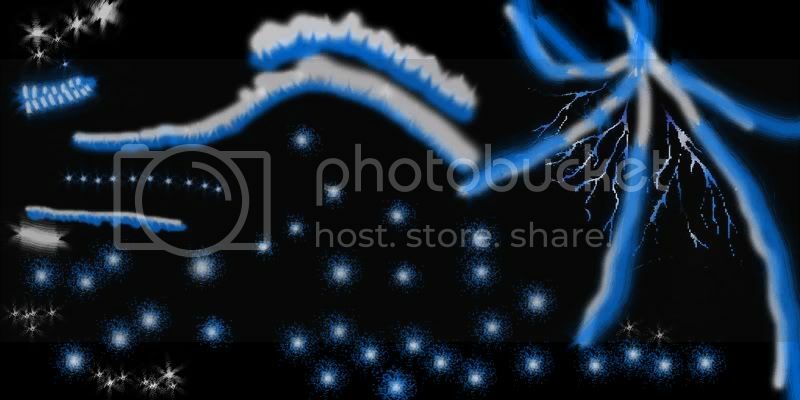 @Daystar: Yeah I figured it out yesterday, the trick was that you needed to give it a black background and then you need to create an Alpha Channel wich is whit in the shape of the picture and black is the background that will be transparent. Cool. Can you do that with this one? My original intent was that it would be just the shimering bits of stars, and that all black would be invisible. Edited by Kronos1000 at 13:48, 23 Aug 2007. I don't know if that would look good, but I can try something give me a few minutes. Doesn't look so great. Could you send me a tutorial by email (jeflin3@comcast.net) or IM? I'll post a full tutorial with pictures in a new thread tomorrow, because I'm not the only one that has problems with this. I made my Tutorial, you can find it here.